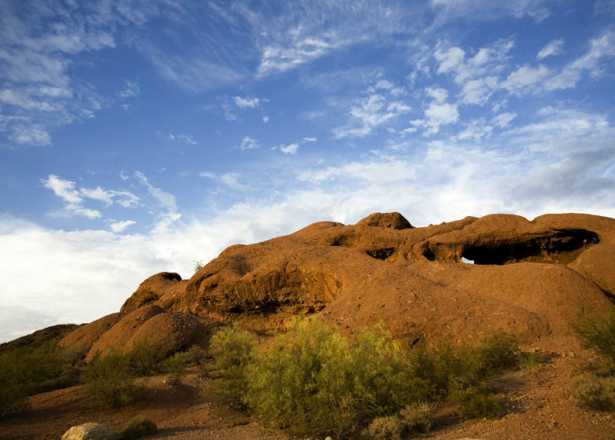 At over 16,000 acres, South Mountain Park and Preserve is one of the largest municipal parks in the country. 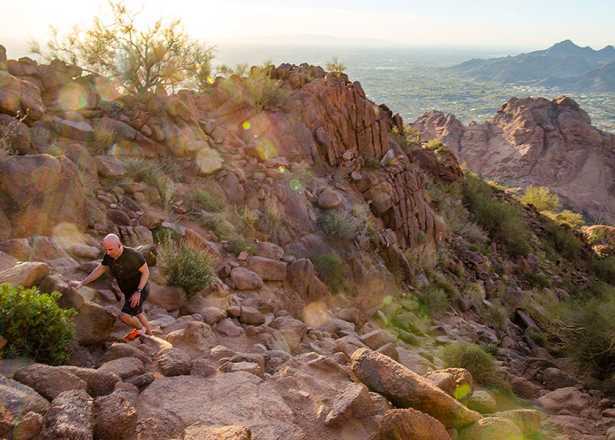 Start a visit at the South Mountain Environmental Education Center, hike, bike and ride more than 51 miles of trails, or follow the road to the top of the mountain for spectacular views. 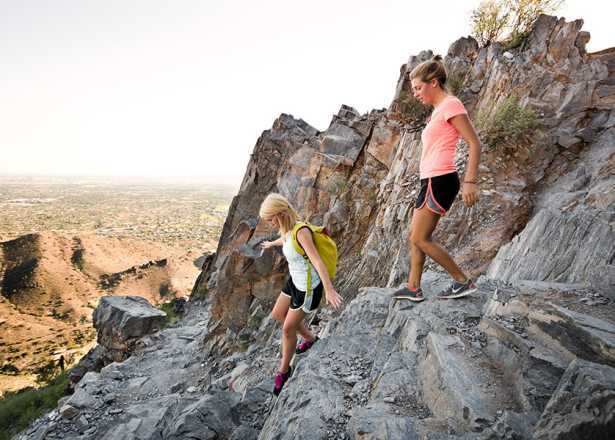 South Mountain offers trails for horseback riding, hiking and mountain biking for all ability levels. Trails are accessible from several park entrances/parking lots listed below. For more information, visit the Phoenix Parks and Recreation website. ​​​​Trailhead Hours: 5 a.m. to 7 p.m. Gated entrances will close at 7, but trails remain open until 11 p.m.
Our picks: Holbert Trail (details below) and Hidden Valley via Mormon Trail (details on our Best Hikes in Phoenix blog). Perched at 2,330 feet with north-facing views of the city, Dobbins Lookout is the highest accessible point in the park. 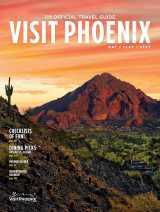 A stone ramada at the top offers shady seating, and a small observation platform identifies various Phoenix landmarks visible from the panoramic view, including Camelback and more local mountain ranges. Summit Road, a scenic, 5.5-mile ride from the main park entrance. On the fourth Sunday of every month, the road is closed to motorized traffic in observance of Silent Sundays. Holbert Trail, 2.5 miles one way. A somewhat difficult, steady climb to the top. Just past the main entrance gate, take the first left, pass the education center, and the trailhead will be on your right. Parking and restrooms are available. Saddle up and explore South Mountain Park the cowboy way with guided horseback tours from Ponderosa Stables. Trail rides wind through pristine desert scenery on the preserve&apos;s vast network of trails. On Saturdays, the stable also offers rides to get up-close with ancient petroglyphs throughout the park. Learn about plants, animals, natural history and the conservation needs of the Sonoran Desert at interpretive exhibits and activity stations inside the park&apos;s education center. Just outside the doors, you&apos;ll also find Judith Tunnell Accessible Trail, consisting of two barrier-free, half-mile loops: the Interpretive Loop with descriptive signs about native plant and animal life, and the Challenge Loop with a maximum grade of 8.5%.